A few nights ago, over dinner, two friends who have a beautiful house in the woods outside Canberra confessed that they're thinking of moving back into the city, because they're tired of worrying about fire. 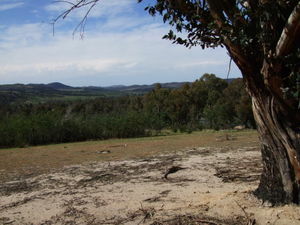 The next day, I drove west out of Canberra into the rolling hills where the January 2003 firestorm had raged. At its peak, it was a arc of fire surrounding the whole west side of the city. It burned into the western edges of manicured suburbs, mowed down the koalas at the wildlife preserve, melted the telescopes at Mt. Stromlo observatory. 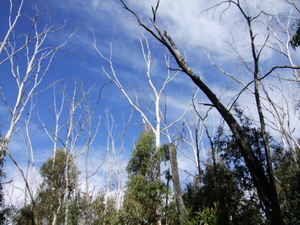 Four years later the regrowth is abundant; Eucalyptus sprouts profusely from burned trunks, quickly reclaiming a shade of its former stature. But still I saw fire everywhere. 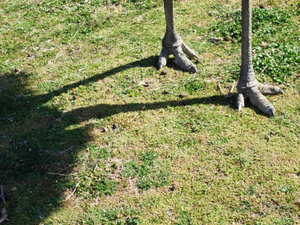 Exposed earth glowed with its usual orange, but for the first time the orange seemed hot. 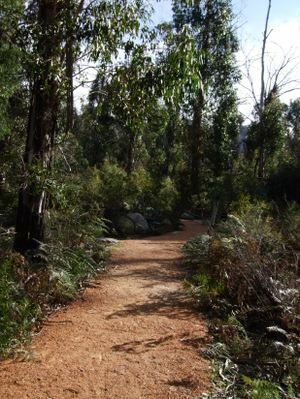 Everywhere I noticed the redness in the trees, how the putative khaki of the Australian foliage is really a dialogue of green and red impulses. 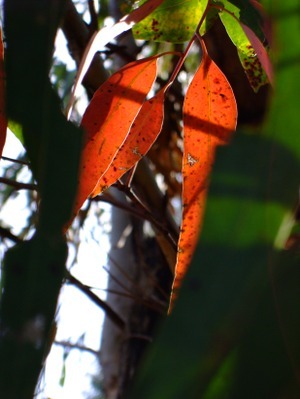 The dominant eucalypts here have prominent red features – red stems, red new growth and a dramatically random scattering of red dying leaves. Such trees flash red as they shiver in the wind, as though recalling their other identity as flames. I have long known that I lack the patience to be a serious birdwatcher. Birds that want me to see them are a delight, but when a bird wants to be known only as a vague rustle or peep, I oblige by not looking further. Many people I admire can hold their breath while gazing intently at a distant quivering leaf, in hopes of a flash of feather that will content them for a prize. Me, I just watch the leaf, the trunk, the tree.